I felt like I haven't taken a bite before getting kicked out, ouch. Thanks for giving me that sense of rush-ness? Wow. Its been ages since I been to Din Tai Fung. Glad to hear their larger store is as efficient as their Mother store, sad that the lines are now just as long. Glad you like Myung Dong. Its definitely one of my fav kal guk su places. Love those dumplings! They also carry whole chicken soup with ginseng (and sweet rice) stuffing. 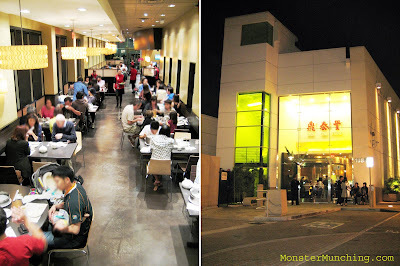 (I need to update my blog tho.. lol...) Oh, I am also hearing that there is another kal guk su place in Cerritos, called Myung Sung (no relation), off Artesia and Norwalk. Sure, the food sounds good. But I'm not much for the places that give you the feeling to hurry up and eat, give them your money, and get lost. I can't relax in that kind of setting. And if I can't relax, I can't digest. Well actually the staff is rushed and always on the move. Us diners can sit, relax and enjoy the meal at a leisurely pace. But as someone on the other side of that line, waiting to get in, you definitely appreciate the speedy turnover. Yeah! Loved it! Thanks again! The dumplings were my favorite there. But then, I'm just a dumpling freak! I may have given you guys the wrong impression. The place does operate on turnover, but you aren't ever rushed to do things at a pace that isn't your own. I'm sure I could've stayed and savored every bite as if it were my last and they wouldn't bat an eye....or at least I hope not. Your post reminds me how long I haven't been to DTF although I know the owner and they know me. Did get to try them again a year ago during a party where they were freshly steamed on the spot. That was a FUN experience. Yummy too. Haha...what you ordered is also what I would order! But I like their pork chop fried rice as well as their chicken noodle soup too. And their 8 treasures sticky rice and red bean dumplings and buns. For you guys never been in Taipei branch. I did in fact order the 8-treasures rice and the red bean dumplings this time (just didn't include it in the review), and had I been hungrier or had more friends with me, I would be all over the fried pork rice fried rice too! It's a better deal than getting the pork chop and a fried rice separately! Oh I'm sure the one in Taiwan tastes much different! I think I read once that the owner of this DTF admits that they try their best to replicate the flavor of their Asia branches, but the pork and even the water in L.A. is much different than that in Asia. Oh well, it tastes good enough! I've been to the one in Taipei, it was a great experience. Another reason for the differences in flavor, besides the pork, is the fact that health codes prohibit the use of bamboo steamers here. The owners, in an article years ago in the LA Times said they just can't get the same quality with stainless steamers. And wow, I'm very surprised that it only took a 10-min wait! Even in Taiwan, it takes FOREVER to get seated. The interior design is beautiful, by the way. True! I can imagine bamboo steamers makes a bit of difference, like BBQing over mesquite wood versus lump charcoal. I do like #2 for the surroundings. Very sharp and cool! But when I want a warm feeling, the original room seems best. Haha...what a coincidence! I did get to try the DTF dumplings in a bamboo steamer once and yes it does make quite a difference! The fragrance of the bamboo goes through, giving the dumpling a great flavor. I heard that better XLB is made out of pork cheek? But it isn't that widely available in the US. mmmmm....pork cheek XLB! That would be something to try! Though that'd be a rare XLB indeed as the cheeks constitute a small percentage of the animal's mass...and there are only two per animal! Still, one can dream of it. 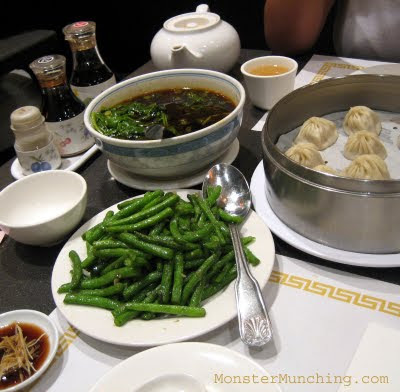 I'm glad you highlighted the green beans at DTF... dumplings there are fine, but the green beans are by far my favorite item on the menu! This is the worst restaurant with terrible service.If you are hungry don't come here. We arrived early before they open, and we were second to be seated. They forgot our order while all the other people came late and the food were out for them. We waited over 20min, and no one ever care to check to see. Yet all those ladies were busy chatting loudly (extremely)while all the other customers were quiet. We finally ask where is our food, and that's when they started to do it. So absurd. After we started to eat, one after another kept interrupting our meal to apologize and to take away dishes (unbearable). This management team is a total failure! No clue to train the employees. Nightmare restaurant!